Next step could be full acknolodgement of the catholic hierarchy, as well as the New Mass, followed by a return to Anglicanism, but maybe without immediate surrender the local Ms. Lady Bishop, now possibly in charge of the diocese to which he was formerly belonging, before entering the Society. Then, after some first coming-together with the Lady Church top management, the mind might change and some nice features of the ladies might be so convincing that by a devout priestress its ambiguities can all be turned in the old direction. I am reminded of the words of Turgon, King of Gondolin: "Then your words can only mean one thing. Even Hurin Thalion has surrendered to the will of Morgoth. My heart is shut." J.R.R Tolkien, The Silmarillion. To be both accurate and fair. Williamson has said nothing new. His recorded interviews consisting of the series "The Faith in Crisis" with Bernard Janzen from the 1980s up to and including the papacy of Pope Francis bear this out. Then -Fr. Williamson in the mid 1980s said in the Interview, "Why the Old Mass." the statement, "Of course be it said that there are many honorable...in my little opinion there are many honorable priest within the Novus Ordo Church or what we might call the Novus Ordo or Conciliar Church,, who are doing their very best to celebrate the Novus Ordo Missae with all possible dignity and decorum. You know, let's not pretend or exaggerate that all Novus Ordo Masses, all New Masses are celebrated unworthily or without any dignity. That's not true." He then points out how change is built into the Novus Ordo while stability is built into the TLM. 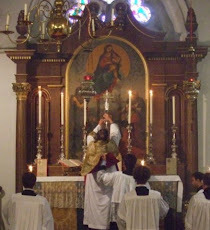 And a Novus Ordo that follows as close to the TLM as much as possible gains stability. Years later, His interview title "The Age of Unbelief" in Canada from his time stationed in Argentina in 2003, He is recorded saying about the faithful and Churcmen in Latin America , "Not all of them have lost their faith and not all of them are losing their faith." Yes, Gerard H. Fair enough. I'm glad you've put the record straight. I simply couldn't resist the temptation .... you know how it sometimes is in this fallen world. I withdraw, and express my gratitude to you. I wish you were in a position to put up an equally strong defence of his utterances with regard to the Holocaust. It seems to me that, there, he did the Church, the SSPX, and the cause of Tradition a fair bit of collateral damage. Quite apart from causing unnecessary pain to people of judaic descent. Even if he was right, which I do not accept, well, that sort of argument about History is not the sort of fight which The Great Archbishop chose to pick. I am closing down this debate and having the last word. Since David Irving got put in prison for Holocaust Denial and several nation states have laws against it, it is remarkable that His Excellency did not suspect that his remarks would create a hooha; indeed, I would feel that it showed naivete and poor judgement abundantly sufficient to justify Bishop Fellay's request that Bishop Richard should Shut Up. There are Jewish interest groups which attack anybody who questions the doings of the State of Israel, and any Christian who hopes or prays or works for the conversion of Jews, as antisemitic. It is already so hard to function against this tyrannous oppression that I feel it is a very bad idea indeed to give them grounds to say "Look! These people are Holocaust Deniers!" Wouldn't that be something if Williamson skipped his old friends in the SSPX and was completely reconciled with Rome before the rest of the SSPX?